At the Equipping for Ministry Phase (III) a disciple has a strong personal relationship with God and has matured to the point that he is ready to begin having a ministry in the life of another person. 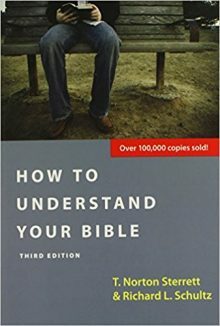 He is ready to learn how to share his testimony and the Gospel as well as how to deal with the questions non-believers often ask. His new venture into ministry will cause him to consider issues such as time management, ministry priorities and spiritual warfare. 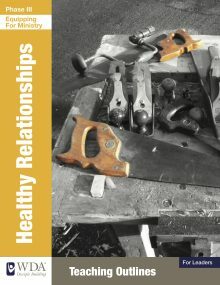 As he continues to grow, he will learn more about the important doctrines that grow out of his position in Christ, and come to understand more about healthy relationships. The material in Phase III has been designed to help a church (or other ministry) develop a progressive disciple building strategy for the ministry trainee. The suggested order to study this series is Spiritual Warfare-I, Evangelism Training Manual or Workbook, Positional Truth, Healthy Relationships, Ministry Principles-I, and Inductive Bible Study Manual or Workbook. 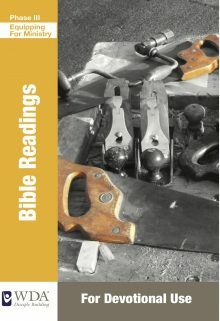 Our Bible Readings for Phase III can be used alongside any or all of these resources. However, you can use our materials in whatever way works best for you and your ministry. Why do we suggest this order? Any time we decide to help Christians grow, we will experience spiritual warfare. Therefore, it is important for a disciple to understand the spiritual conflict that will arise, and for this reason we begin Phase III teaching with Spiritual Warfare. We suggest the Evangelism study next because it requires the most amount of time outside of group settings to practice the principles being taught. For this reason it should be introduced early in the Ministry Training process. An understanding of our position in Christ (who we are in Christ) is also essential as we minister to others. As we minister to people and as we grow ourselves, it is important to know how to develop and maintain healthy relationships. Understanding the principles that govern ministry at the equipping phase is an important part of the process of ministering to others. 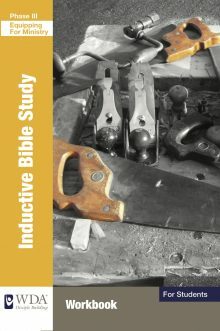 Finally, learning to study the Bible inductively is a valuable tool in our ongoing relationship with Christ and in our ministry to others.